That's great that there's a PDF of it. Robert Livingston is going to make a PDF version himself. I guess this will save him a lot of work unless he is going to make some changes. This is a great reference, but, is this legal? Someone simply uploads this to Scribd; is this (normally) with the author's permission? I'm asking since I wasn't familiar with this site until I clicked on the link above. I've seen works removed. So the authors have to react. But, it does look like it's open season on even copyrighted material. I've never been too convinced about this work. It certainly contains some useful data but a lot of the interpretation of that data has been subject to plenty of revision and criticism. My own copy came with at least 10 loose separate pages of addenda and errata, and the changes just continued to flow across several internet forums over a period of 2-3 years. Eventually I just gave up trying to keep track of the alterations and evolving theories. "My own copy came with at least 10 loose separate pages of addenda and errata,…"
As did mine and I agree with your assessment but I am not aware of any other similar published work on the topic – ? Hormswoggler, see if the Russian gun data on the Scribed copy page 59 is the same as in yours. 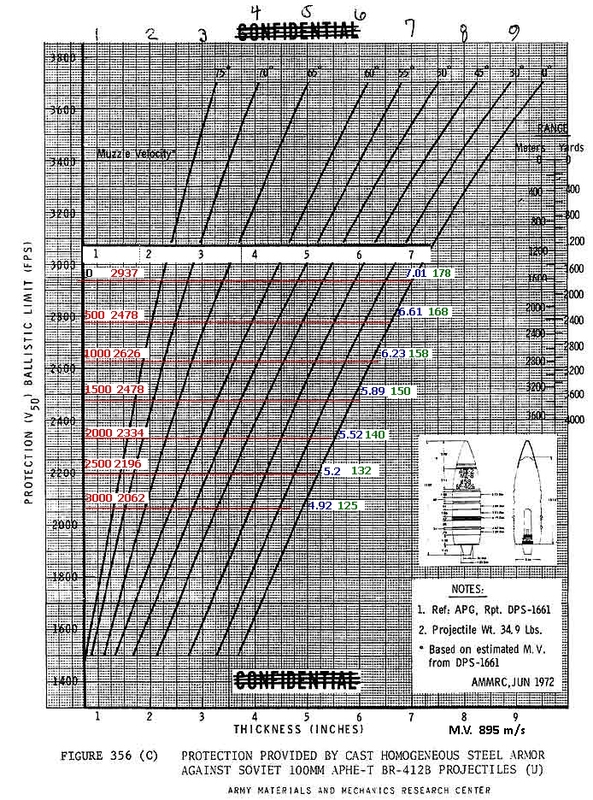 It's come to my attention that the penetration values for the 100mm and 122mm guns is different on my copies (I have first and second editions) than on the one sent to the Copyright office and is in the Library of Congress. I can't explain why. But, now Wikipedia and War Thunder wiki have picked it up and is using it as fact. This late hour revision is wrong. My copy is first edition (?) 2001. I at first thought it was a hoax. Someone trying to influence the devs at War Thunder or World of Tanks. But, it now seems legit. It's been available since at least 2012. The changes didn't spill over to the K factor table. It still has the old 100mm AP MV of our copies. Wolfhag, I recently (today) modified my Naval Armor and Ballistics program to compute the penetration of tank guns to check on things like this. There was talk of a reprint with up to date corrections a couple of years ago, but I suppose that went no where. 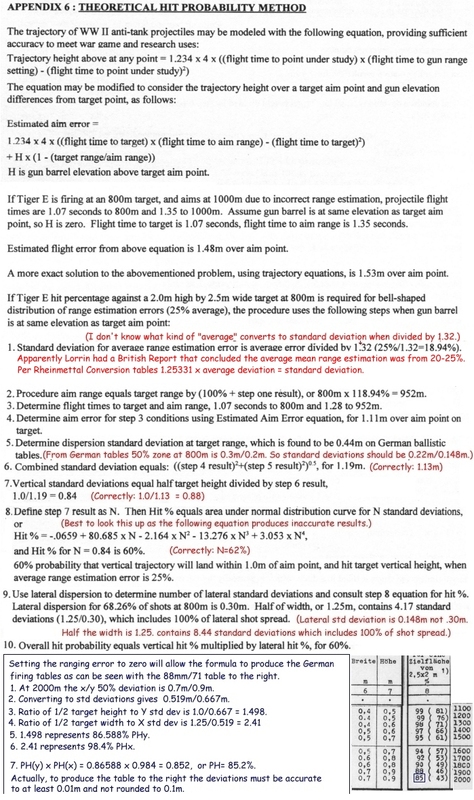 As I have stated before, the 1977 US Army Tank Gunnery manual in the introduction states that in 1944-45 ifor a Sherman firing at a Stationary German tank at 500 meters, it would take 13 shots before a tank gunner reached a 50% chance to hit. Small arms chance to hit is even less. If we used realistic chances to hit most players would get tired and stop playing. Rudy, that might have some credibility if it was in the text of a 1944-45 Sherman Gunnery manual. There is no citation to refer back to find the study where that came from. All the army did after the war was conduct studies on almost every aspect of the war. Many have been made available to the public but not all. Every university has a treasure trove of thesis and doctoral studies that have never been published but are available at the department or library.Auburn's was at the department rather than the library. The army has been very good a making studies available. You just have to look for them. I could not find on page 41 taking 45 seconds as an average time to hit an enemy tank. Does it mention range and number of shots to get a hit? I'll check out the new program, thanks. Oh I took the title of the table above it as the graph legend. It's not. I thought the 'x' were to be filled with variables from the graph. On the other hand the study has an interesting tank duel algorithm of which tank is likely to win. I wonder how that would apply to the Russian decision to go with the slow firing 122mm gun rather than the faster ROF 100mm. Mobius, I hope you are safe in the Los Angeles area. Fires are dangerous do not take them lightly. Wehen I was at the local EMA we had to deal with them frequently in the National forest area of our county. Thanks Rudy, Safe for a few more years. Mountains near here burnt off a couple of years ago. Current fires are about 35 miles away. So I'm piecing together what happened. According to Robert Livingston after publishing the second edition Lorrin received two graphs. This one of the 100mm APBC round. And one like that for the 122mm APBC round. Lorrin made changes in the tables in his book per these graphs.